Although we’d been in the Bandares Bay area for over three months and explored all the coastal towns, we really hadn’t checked out any of the neighboring inland towns. While we were sailing south, friends on s/v Navigo (Bob and Camelia) were still in Bandares Bay and spent a little time checking out the little towns of Jarretaderas and Pittial. They were excited to share their finds with us upon our return to the bay. The Jarretaderas recap can be found here. After our wonderful evening in Jarretaderas, I was excited to check out the next stop on Navigo’s “tour.” They really liked Pittiall and their stories about the various shops and vendors there made it sound like an excellent place to check out. Our usual Spanish pronunciation lesson: Pittiall is pronounced as “Pee-Tee-el.” Or, just think of it as an acronym – P.T.L. This trip required two busses. The usual “Directo” out of Paradise Village/Nuevo Vallarta and a jump to the “Pittiall” bus at the Walmart. Once again, without Bob and Camelia we would have been lost, so I’d advise anyone that wanted to explore these inland towns to check with locals or long-time cruisers that know the area before jumping onto the busses. Even now, I know I’d be able to find the correct busses, but not sure if I’d remember the correct stop in Pittiall (although, if you can speak enough Spanish to ask the bus driver, they usually remember to let you off at the correct stop. OR sometimes other bus riders will jump in and help you). Turns out, the night we headed into Pittiall, there was a large political rally being staged in the town square. The place was buzzing with traffic, mobs of people and the night air filled alternatively with loud music or cheering. We had second thoughts of staying since we’d all been warned at some point about avoiding political protests and/or rallies as a tourist. But, there wasn’t any sense of unrest in the crowd, mostly it just looked like families out and about and there happened to be some guy in a suit giving a speech. So we skirted around the square and headed for the taco restaurant Navigo wanted to go to for dinner. Another great gem. Honestly, you don’t need a restaurant with a lot of choices – just a place that does a couple of dishes really well. At this place it was the standard tacos or quesadillas filled with either beef, chicken or pork and your choice of either beer or soda. However, this was one of the only places we’ve been to with an option of El Pastor. El Pastor is shaved pork. 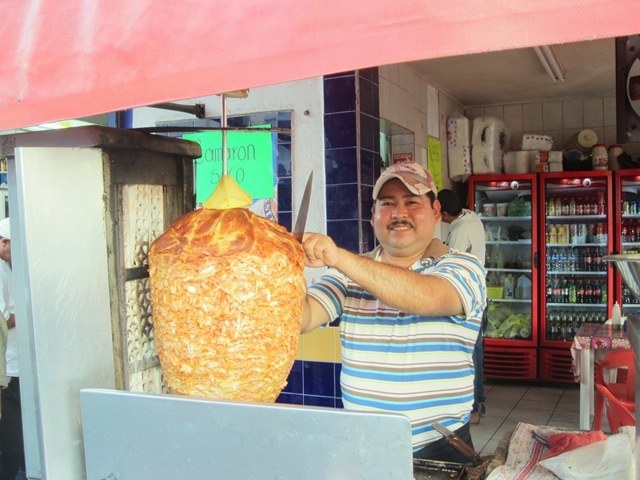 In fact, it’s a big hunk of pork usually hanging above a taco stand grill and you an watch them shave your pork off and right onto your taco. It is delicious and I always order it if I see it on the menu. 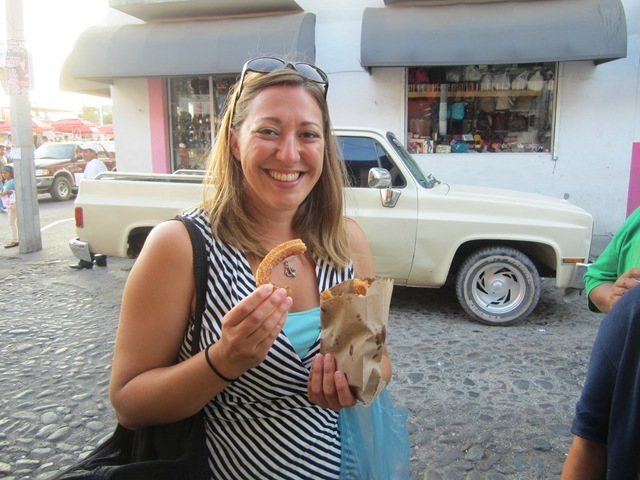 After filling up on tacos, we walked to the churros cart that was sitting on the street right outside the restaurant. How can you resist blobs of fried dough covered in sugar???? Unlike in the states where you get one long strip of dough, here in Mexico they give you a little baggie with six or so small strips. They’re so crunchy and awesome. You know they’re going to be good when all the locals are lined up waiting for a fresh baggie. Next door was a small shop that Navigo pointed out as the local spice shop. If only we’d known weeks ago! Sure you can get most spices and herbs from the larger supermarkets, but there are some spices you can’t find, like curry powder. This store has it. It has everything. And nuts, dried fruits and candy on top of that. Dave and I were recently given curry powder from a friend willing to share their stash, so we really didn’t need anything, but Dave couldn’t resist getting a couple of kilos of dried fruit. YUM! 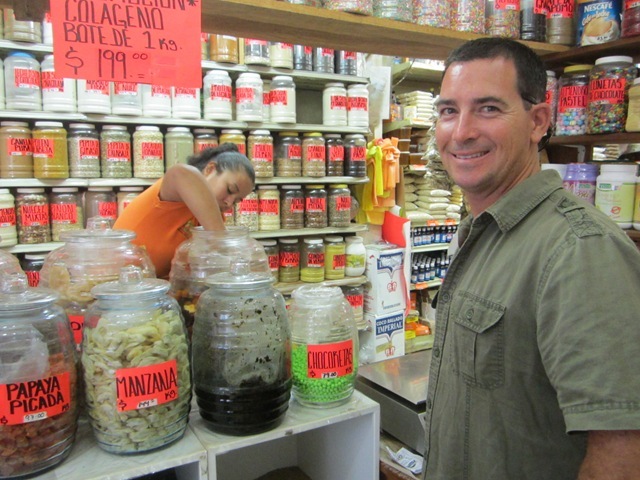 Spices…wait…um…Dried Fruit for Dave! We really didn’t have anything in particular we wanted to do after the spice store, so we just walked around a bit. 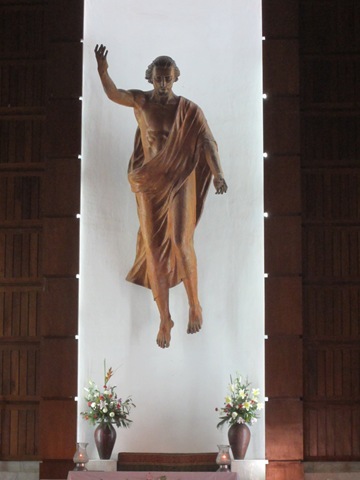 I checked out the church on one side of the plaza with it’s very unique statue of Christ suspended from the ceiling. The four of us poked our heads into the various clothes and zapato (shoe) stores. At one point the boys walked over to the florist shop and both returned with a rose for us girls. I guess they do like us! Exterior of Pittiall’s church (L) and the large, suspended Christ statue over the altar (R). At some point the political rally portion of the evening ended and was replaced by people just milling about and partaking in the yummy treats being sold along the far side of the plaza. 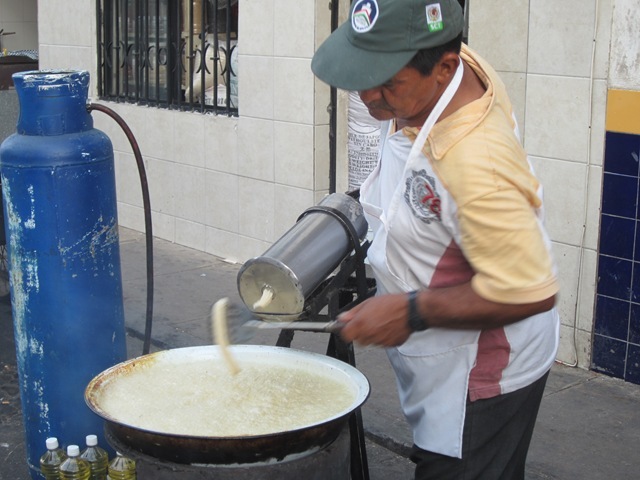 Our favorites were the crepa lady with her decadent, chocolaty, sweet crepes and the fresa vendor with fresh strawberries covered in crema de leche and azucar (cream and sugar). I was beginning to feel like a weeble wobble doll after all of the evening’s treats! Somehow we waddled back to the bus stop and headed back towards Paradise. During the first bus ride out of Pittiall, a local man asked Bob how we found out about Pittiall. He explained that we’ve been living in the area for a few months and had some other friends that had showed them around. 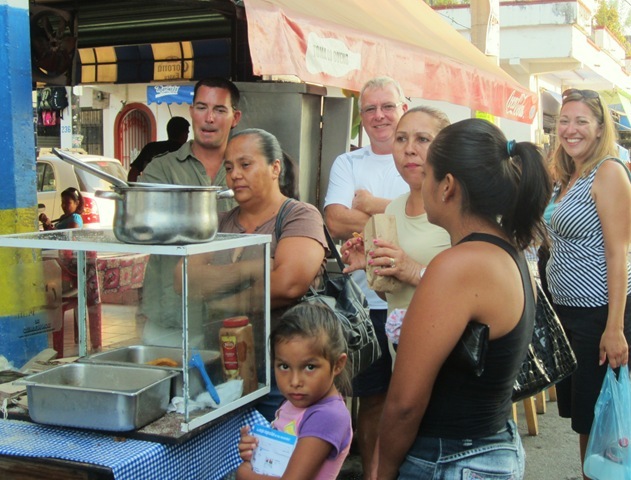 The man said he was impressed that us gringos would venture out of the tourist area. Honestly, some of my favorite moments on this adventure has been venturing out of the tourist areas. 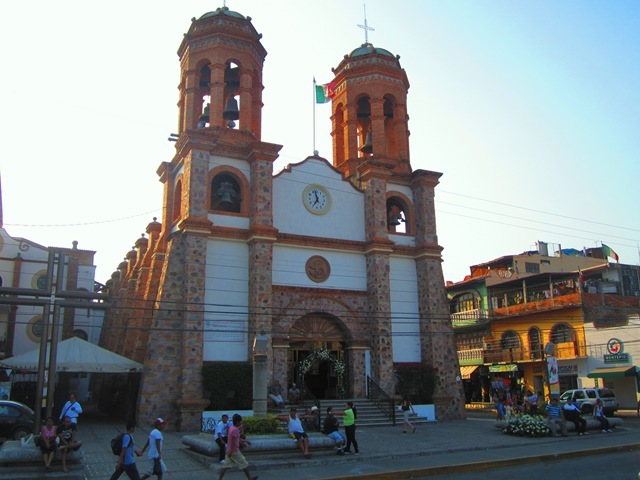 I might have enjoyed walking down the Puerto Vallarta malecon in the heart of gringo land, but I’d much rather wander the streets of a small town like La Cruz or Jarretaderas or Pittiall. 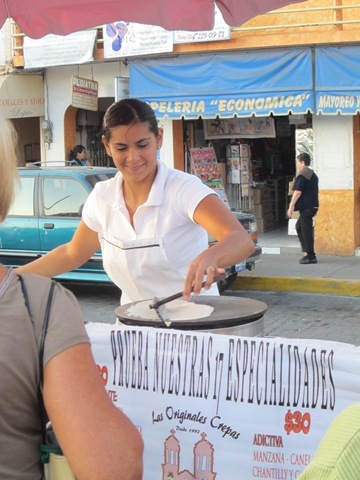 It’s so much more interesting and gives you a local view of life in Mexico.